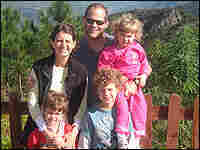 Honey, I Exported the Kids Alan Paul of New Jersey is raising his three children 6,842 miles from home, after his wife was named a Wall Street Journal China bureau chief. Paul loves seeing his kids experience the world but worries that they'll grow spoiled by the artificially high standard of living. Two-and-a-half years ago, Alan Paul was living an idyllic life. He had a nice house in the New York suburbs, where he lived with his wife and three children. He was working his dream jobs as a senior writer for both Guitar World and the basketball magazine Slam. Then the offer came. Not to him, but to his wife. She got a great job offer: to be a Wall Street Journal bureau chief. Just one catch — it was the China bureau. Sensing a unique opportunity, Alan and his wife took the plunge. They packed up the kids and moved to Beijing, where they've been living ever since. It has been a wonderful, difficult and sometimes scary experience, and Alan has been chronicling it all in his biweekly Wall Street Journal column, "The Expat Life." Paul says the kids now live a cushier life, with a cook and first-class air travel. They travel to exotic locales throughout Asia. Paul wonders how the family will readjust to normal life. "You hear your 5-year-old kid talking to another 5-year-old kid and saying, 'So, what do you think of Malaysia? I think Thailand's a little nicer.' Those kinds of things give me pause," he says. On the other hand, the family has a limited window to enjoy the experience, and they intend to take advantage of it, he says.